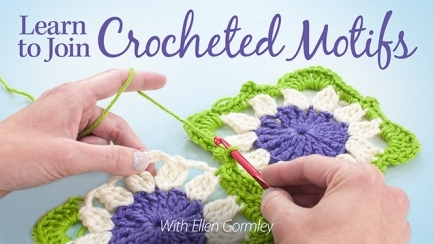 Ellen Gormley, the editor of Crochet! magazine is not only my coworker, but a good friend and fellow crochet enthusiast. One of the things I admire most about Ellen is her infectious teaching style both in person and on camera. Ellen has more over 300 published designs including garments, bags and accessories, and home decor. She has been published in numerous crochet magazines and has written five books, including Go Crochet! Afghan Design Workbook, published in 2011, and Learn Bruges Lace, published by Annie’s. 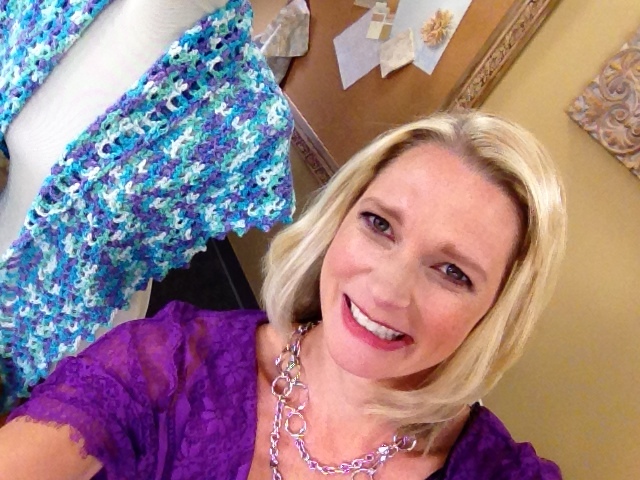 She is the instructor of several Annie’s online classes including Learn to Crochet and Learn to Read Symbol Crochet Diagrams video classes and is also one of the crochet experts featured on Knit and Crochet Now! which airs on PBS. 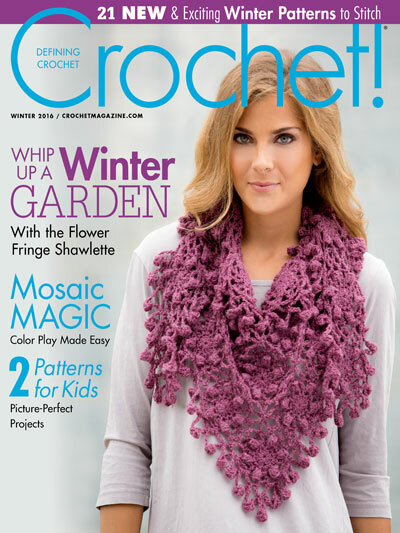 In 2013, Ellen was named editor of Annie’s Crochet! magazine. I thought it would be fun for you to learn a little bit more about Ellen so I recently I had a conversation with her. Jackie: Tell us a little about yourself. Did you grow up in a crafty family? Ellen: My mom was a dabbler of all things yarn and needlework. I remember only a few finished items but I know she had many, many unfinished items of all types of needlecraft. We lived next door to my great aunt Margaret who was an avid thread crocheter. I’m sure she influenced my love of the craft. How did you become interested in crochet? Since my mom and great aunt crocheted it was natural that I would learn. My mom and I made a scrap granny square blanket for my grandmother and that project seemed to have sealed my love for crochet. In addition to being a designer, the editor of Crochet! 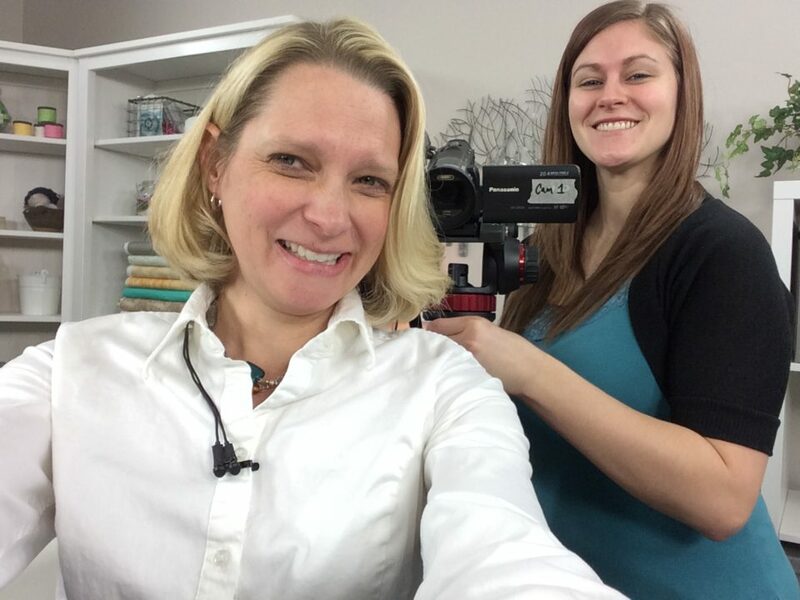 magazine, authoring several books, starring on Annie’s Knit and Crochet Now TV, you also have done 6 video classes for Annie’s. I love your classes, you have such a relaxed and encouraging style. You are a natural. Tell us a little bit about what it is like to film the TV show or a class. I know from personal experience it is not as easy as you make it look! Thank you! There is no real magic except the video team making it seamless and professional. I truly believe in leaving in “mistakes” when I’m teaching, instead of pretending they don’t happen. Those mistakes can be great teaching moments, as we all make mistakes. Students will make mistakes too and confidence comes from learning how to fix them. I love demonstrating how to go back and “undo” and do correctly. I try to remember to speak slowly and to repeat steps. The beauty of video classes is that you can watch and re-watch as many times as needed to learn. On video the instructor will have infinite patience! Which class is your favorite of the Annie’s classes you have filmed? I have a soft spot for the Learn to Crochet Lace class. 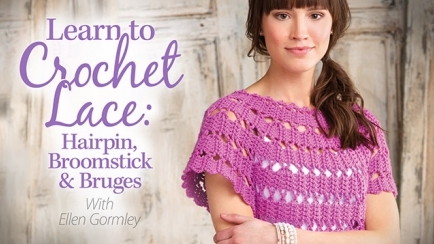 I love all the projects but in my opinion the Broomstick Lace Shawlette is worth the entire class. I have made that scarf several times for gifts and I keep going back to it. Any words of encouragement for crocheters that want to learn more? Hold the hook any way you need to in order to get the job done. Short lessons over multiple days is the way to succeed. Use yarn that is smooth and not too dark in color. Use a yarn color that makes you happy. Don’t assume your first project will be gift-worthy, instead keep it for yourself so that you’ll see how far your skills have progressed over practice. Want to give Ellen’s classes a try? 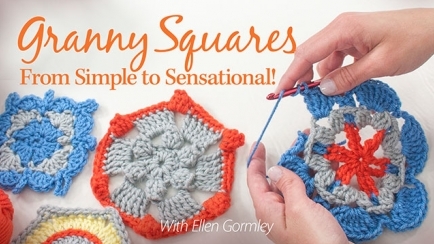 Get 20% off the digital download of Ellen’s Learn to Join Crochet Motifs and Granny Squares: From Simple to Sensational, November 30 – December 7. Use discount code CWELLEN at checkout or begin shopping here.